So what is this method? It's extremely simple. Step 1: Take a C (aka 1*) CE, feed it 4 duplicates of itself, add another 12k worth XP from UC/R CEs, then add another random C CE, for a total of 17k XP added. The following are the 3 ways to do this, just keep in mind that they don't need to be those specific CEs, just the same rarity. Step 2-up to 120: Repeat this process, but replacing the random C CE in Step 1 with what you previously leveled. HOWEVER, DO NOT EVER USE A MAX LB C CE THAT IS THE SAME TYPE AS THE NEW BASE YOU'RE GOING FOR. 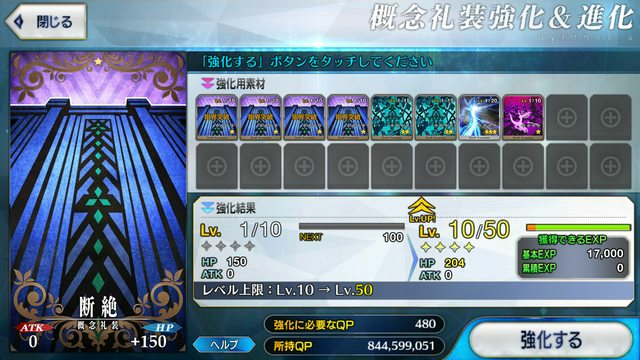 DUE TO A QOL UPDATE, THE GAME PRESERVES LB CRYSTALS BY ASSUMING THAT IF YOU FEED SOMETHING THAT'S BEEN LB TO ANY EXTENT TO A DUPLICATE CE, IT'LL TREAT THE QP COST AS IF YOU'RE ADDING STUFF TO THE HIGHEST LB CE, AS SEEN BELOW. 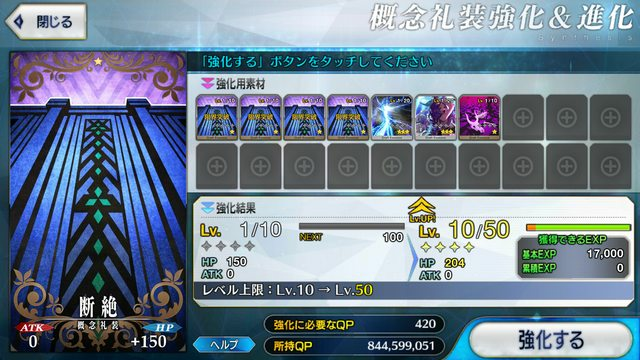 IF YOUR QP COST IS EVER GREATER THAN 540 AND YOU'RE FOLLOWING THIS METHOD, YOU ARE MAKING THIS MISTAKE. After a maximum of 120 times of this, you will end up with a level 50 C CE, costing you 50400-64800 QP, assuming you never once got a Great or Super Success. 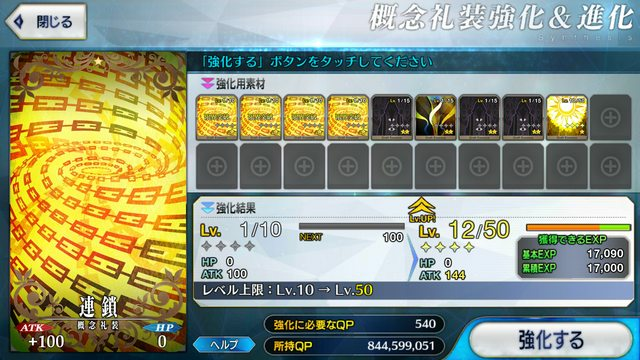 You will need 8 of these CEs to raise your choice of max LB SSR CE to 100. In terms of QP, each level 100 SSR CE will cost 403200-518400 QP, assuming you never get a Great or Super Success. Compared to my previous method, this saves you anywhere from 219240-334440 QP, assuming neither method netted you Great or Super Success. Even if you did get it, it's not going to alter it by all that much than, maybe, 20000. Also, this will result in a very slight amount of wasted stored XP, but you can solve this issue with the 8th CE only being raised normally until you would see it hit level 50, then choosing to only feed it 4 duplicates + 5k random XP + leveled C CE. But what if I want to get even more efficient? Well, you can make a max LB C CE that's only made up of 4 duplicates, feed that any mix of 20 SR CE/SSR CE/R CE XP/SR CE XP, then go back to following the leveling method already described to save anywhere from 1220-15660 QP per level 50 C CE, or ~10k-100k QP per level 100 CE. Course, you could also just burn those CEs and make any QP difference between the methods smaller than it already is + get some mana prisms.